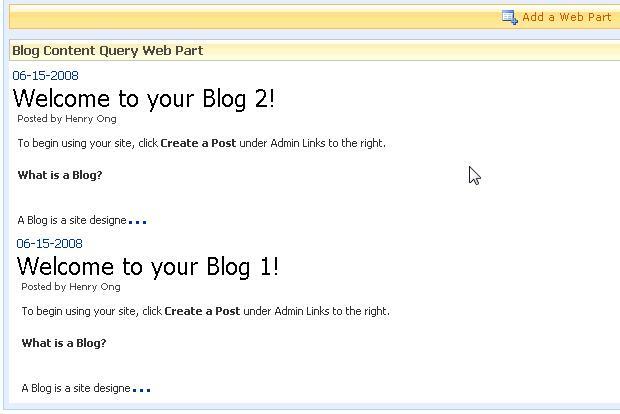 Ever wondered how to have the Content Query Web Part (CQWP) aggregate SharePoint blog posts from the SharePoint Blog site templates? Oh wait, that’s already possible. How about aggregating blog posts, customizing the XSL styling and being able to display the first 200 characters of the post as a preview? Believe it or not, I couldn’t seem to find a single definitive blog post on how to do this so I’ve decided to write one up myself. Follow all the steps in this blog post. 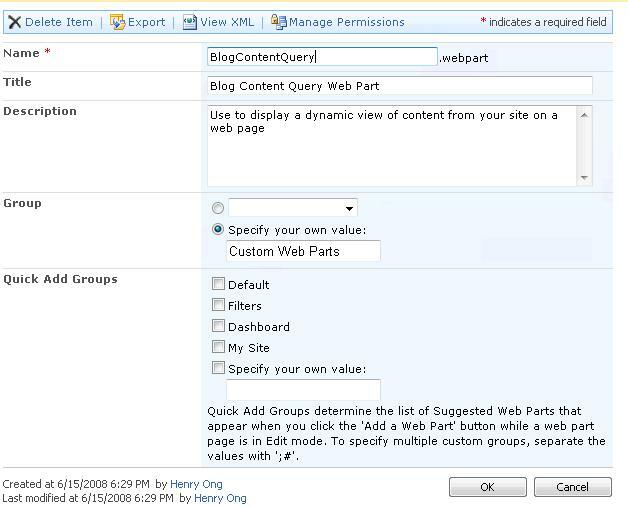 It will give you a good overview on how to customize the Content Query Web Part to aggregate and display News Article items along with the quick summary display and some other item properties. So after much head scratching and googling, I came across this blog post and this blog post that gave me some hints as to why this doesn’t work with the Body field of SharePoint blog posts. Apparently the Blog Site template and the Posts Document Library contain more than one Content Types (one for posts, one for comments?). But wait! He says we can override the Content Query Web Part. Unfortunately… there doesn’t seem to be an available BaseType for blogs. Save your Web Part file as something other than the default file name. Upload your customized Web Part into your Site Collection’s Web Part Gallery. It would probably be helpful to give it a unique name and group. Add the new web part to your page and voila! « Acrobat.com/Adobe Buzzword + SharePoint? Nice writeup and much needed as well. I get this error when I check in the itemstyle.xsl with your template. Hey Mark, the copy paste should work as is, but if it doesn’t let me know which parts need to be updated. The GUIDs will be unique to your environment. thanks for the article .but infact when i copy and paste code i get “Unable to display this Web Part. To troubleshoot the problem, open this Web page in a Windows SharePoint Services-compatible HTML editor suc” Please help i will really appreciate any assistance in this mater . Hey Omar, it’s probably some typo or something pointing to something unique that may not be available in your environment. I replaced the ‘”‘, ”’, and ‘…’ quotations and that didresolved some issues for me. This stuf i very tough to trooubleshoot also. Also , when I add a specific GUID ( I got the guid from the URL of the posts) , I cannot really get that webpart ot disply also. Also , why do you have two seperate guids for the same blog ? Hey man …the override with the list ID’s just doesnt work. I cannot even import the webpart with the list id. I realize you have tow list ID’s beause one is for the posts and other for the comments (How did you even get this list id). any help is appreciated. Hey Z, in my example each GUID is for a different blog site’s document library that contains the posts. I haven’t tried using the CQWP for comments. aah makes sense…thanks a lot ! I still am struggling with even adding this one line and not getting an error when I import the webpart. I wonder what I am doing wrong….. I finally got it to work !!! thanks this is really helpful. Works great… BUT… the truncating of the Blog body field does not unfortunately leave “valid HTML”… with the result that if your blog posts contain any html formatting this will then “leak” out into the rest of the page. I wish there were a way to access the functionality for the “summary view” for the list view web part. That somehow magically truncates any rich text – without any “leaking” problems. I’m getting the blog like it shows in the Step 3. Did you see anything wrong in my code? Ok, I make it works!! I change a few things to try. 2nd: I don’t rename the field on the “DataColumnRenames” property of my .wepbart file. 3rd: I use Body, RichHTML on the “CommonViewFields” property of my .webpart file. The rest is the same as you use here. Does anybody know how to get the blog name?? In the CQWP settings I open Presentation and group by . Is that what you are looking for? I was wondering if it capable of seekingout all blogs on the server, or maybe the latest 20 posts from 20 different blogs automaticlly with out having to add the blogs to the web part..
What we are trying to do is have a blog aggregator that dynamiclly finds blogs created by staff and displays their posts in the aggregator rather than the sharepoint admins having to add a new blog everytime a new one is created. ya Dan, you just point the Query Source to show all sites in the site collection, or if you want a specific site set it to show items from the following site and all subsites and browse to the level you want. I’ve tried following the directions you’ve posted a bunch of times. Starting from scratch, reviewing and what not. I cannot for the life of me get the body of the blog posts to show up in the query. I get the title, date, author and the “…” link, but just no body of the blog post. It’s been quite frustrating so ANY insight to this would be very appreciated. I added “Body, RichHTML” to the CommonViewFields property in the webpart file and created a custom item style in ItemStyle.xsl to show the Body of a blog post. I could qute Toma:s post exactly, I can’t for the world get the description to show up. Any Ideas? Anthonyyy, I’ve tried with yours too, but it didn’t work as well. I’m at a loss. Ok, I did end up getting this to work. With a combination of the other replies assistance. I really am a newb when it comes to modifying the itemstyles, but I noticed, even in the example images posted above that the entries slowly indent as the number of blogs grows. I’m happy as hell that I finally got the posts to show, but if someone could help with some of the aesthetics I would be grateful! I have tried what feels to be endless solutions to get this body text to display. I am at a complete loss as to why the value is not selected and displayed. Does anyone have some definitive answer as to how to get it to show up aside from the snippets in the comments? Can someone please help me out with this. I’m getting all the way to step 4. 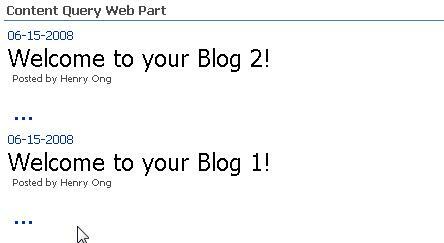 My webpart will not display the teaser text for each of the blog entries. From reading all the replies I’m not really sure what to do at this point. People have said “I finally got it to work” but didn’t say what they are doing. Please help! I had to use Ariel’s advice and use @Body in the .xsl file to get it to work. We are in business. Great Post though thanks Henry. unfortunately I cant post the template on here for people to use! Content and Code developed a blog aggregation web part. Whcih is available from our website. For those of you who still haven’t gotten this to work, try deleting the custom web part on your page and re-adding… For whatever reason, I had two of the same custom web part in my webpart gallery. I’m pretty sure I always had ‘Overwrite existing files’ checked when re-uploading. I tried all the stuff mentioned by you but failed at the Step-3. I tried replacing the “”‘ … ‘””(Copy paste) with “”‘ … ‘”” (manual written) but i am not able to resolve the issue. Building backlinks is most important part of SEO. Web Directory submission can help webmaster to promote their websites by building backlinks, increasing exposure and traffic. Link Builder is a link building resource. You can list your website on search engine friendly and article directories to use as site promotion tools. You can submit your link for free without registrer. Nice with XSL on blog site. a post on a site or if I have something to valuable to contribute to the discussion. It’s caused by the fire displayed in the article I browsed. not mind. I was curious to know how you center yourself and clear your mind prior to writing. You will discover other beneficial rewards of listing a business on an internet enterprise web-site directory. As a result of advertising is often expensive for any business enterprise, substantial or small, listing with an online small business directory is really a expense efficient approach to publicize your enterprise. Listing can be relatively inexpensive, oftentimes about $5.00 to $10.00 a year. When listing within a conventional paper directory, after it is printed and distributed, it can’t be changed. A web based business directory allows you to modify and update your listing at any time. Prior to deciding the package for low-priced hosting, it is actually smart to make an substantial search, as outlined by your requirements, their reputation, customer service, fees, and rules. If you expand the company they should really have the solution of expanding the hosting space or you need to switch more than to private server, as your business expands. foresee difficulties just before these people occur. opposite specialists of this secttor don’t notice this.